from Wexford, Ireland , twins Brandon and Ashley combine to create The Ocelots. 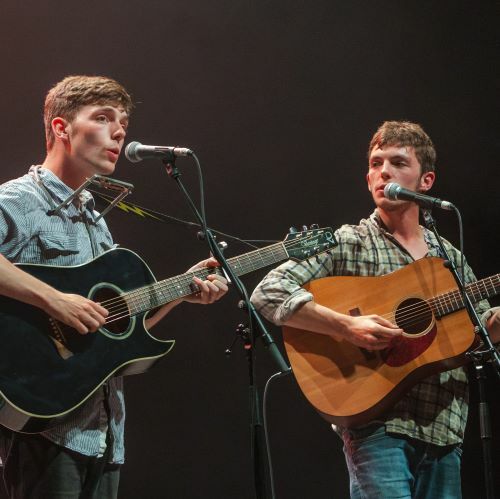 They have crafted their songwriting and musical experience together to produce a forceful blend of rich harmonies and bare, raw acoustic folk. The Ocelots started originally through busking around Ireland, before playing their music throughout many stages all across Europe. The brothers are known for their ability to capture an audience, with mesmerising melody and variety meeting their charm and wit on stage. Brandon and Ashley showcase their music through random pop up videos online, where they get to perform under bridges and outside city halls.